This is what my Audi's bumper looked like before I went to ShopRite for the second time yesterday. Someone hit my brand new, 16-days-old Audi A5 in the ShopRite parking lot yesterday afternoon. And he/she didn’t bother to leave a note or wait for me to return. They left. Funny thing. I actually think about where I park my new car to minimize damage to its body. I parked my car on the end of a row so the likelihood of it getting dents on both doors from careless people slamming their own car doors into it is minimal. I heard about doing that from the friendly teller at TD Bank. I’ve been parking waaayyy out in the parking lots to avoid other vehicles. 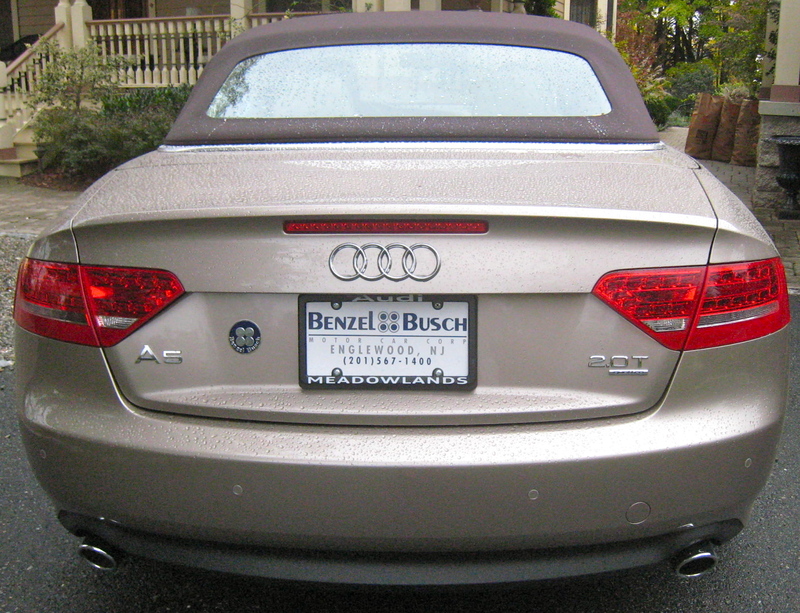 I’ve been trying to conscientiously care for my new car and keep it nice. Having been at ShopRite a mere two hours earlier, but realizing that I’d forgotten my “free” ham, I returned for it and a few other forgotten items. I was in the story 40 minutes max, but it was enough time for someone to back out of his/her parking space, put his/her car in “drive” and misgauge the distance from the front end of his/her car to the rear end of mine on the swing around. You know what? I think it was someone too old or infirm to still be driving. The store was full of elderly folks hanging onto their carts as they purchased their Thanksgiving ingredients. Many of them could barely see as they put can or box to the end of their nose for a closer look; many are very deaf and can’t hear you when you politely say “excuse me, please” as you pass by. And most are entirely alone as they s l o w l y make their way down the aisles. Unfair? Did I hear you say it’s unfair for me to accuse an elderly person? You know why I think that? The person who hit my car didn’t apply his/her brakes; he/she just kept turning his/her wheel and gouging out my bumper and scraping along it til he/she reached the end then just drove off. The damage is two deep gouges that go clear through to the actual bumper material underneath. . .and even that underneath is scraped terribly. If you have even half your wits about you and you can still see and feel properly, you’d have realized you hit something and reversed out of it. No? NO? 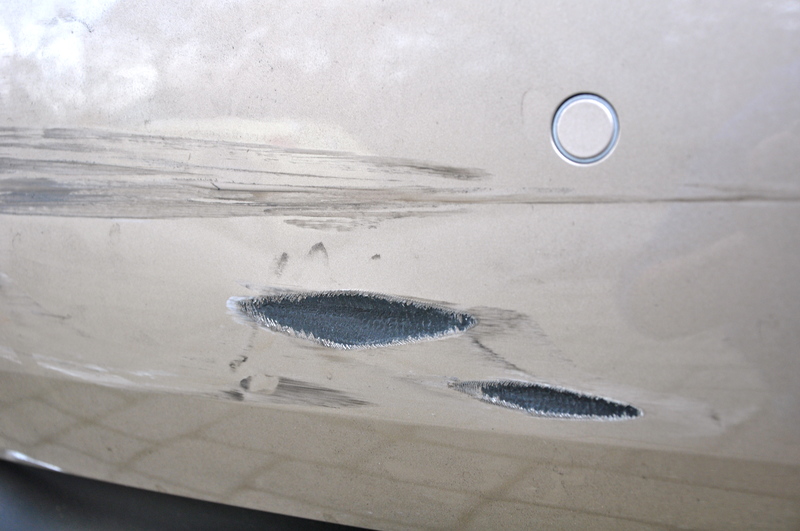 This is what the Audi's bumper looked like after I returned home from ShopRite. The alternative is that someone saw a brand new car and hit it on purpose. I can’t even wrap my head around that. The security guard agreed with my initial thought of an elderly person; he said he sees older people hit cars in the lot on a daily basis. Store security doesn’t have security cameras where I parked. I checked. No one left a note on my windshield telling me they saw who hit me. I checked. So my free ham, the one I saved $18 on, is gonna cost me. Big. And the person who hit me? Elderly or not, he/she is Dishonest. Self-centered. Rude. He/she ruined my day and weeks to come as I file an accident report, send it in to the State of NJ, deal with my insurance company, take the Audi to get repair estimates, do without my vehicle while the repairs are made and pay, pay pay for something that wasn’t my fault. I’d like to ruin his/her day. That’s how angry I am. I am not calm. I hope to be in a few days or weeks. But right now? Oh gosh…I’m sorry! I saw an old bag driving a humongous land yacht totally knock down a US Post Office mailbox at the PO in Cedar whatever on Rt. 23…my uncle backed in to the Jeep last month – in his driveway…but, of course – I have a small reminder of your last visit…when I backed in to that little pole at the pizza place…never heard the beeper…I smile every time I glance at that ding and remember our night of solving the world’s problem over wine!!!! It was fun!!! XOXO!! !